Company Name Filling & Packing Matirals MFG. Co.
FIBCs are most often made of thick woven polyethylene or polypropylene, either coated or uncoated, and normally measure around (80~110cm) in width and varies in height from 100 to 200cm. Its capacity is normally around 500 kg : 1500 kg, but the larger units can store even more. A bulk bag designed as per customer request and as per capacity limit the average bag weigh (2.0~5kg). Transporting and loading is done on either pallets or by lifting it from the loops. Bags are made with either one, two or four lifting loops. Emptying is made easy by a special opening in the bottom such as a discharge spout, of which there are several options, or by simply cutting it open. About Filling & Packing Matirals MFG. Co. Filling & Packing Materials Mfg. 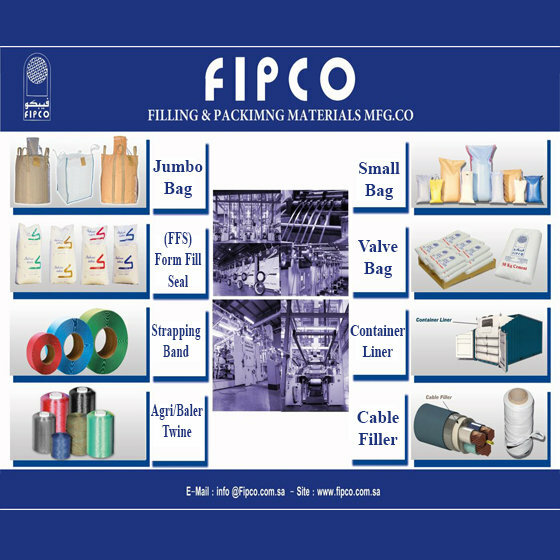 Co. (FIPCO) has been offering FIBC and other Packing products made of Polypropylene & Polyethylene to various type of industries for over 25 years. With our customized manufacturing practice no customer is too big or too small for us to accommodate and we can offer very competitive pricing with the quickest shipment schedule. Our clients/customers always receive first rate service and we stand behind our products. Allow me to introduce ourselves briefly. FIPCO is an ISO 9001:2008 certified, Saudi Joint Stock Company located in Riyadh, Saudi Arabia. We are one of the leading manufacturers of high quality FIBCs / PP woven Sacks / PE Liners, PP fillers, PP/PET strapping band, Valve woven Sacks (Cement Bag) & FFS. We manufacture PP woven Bulk Bags as per required specifications of the customers. 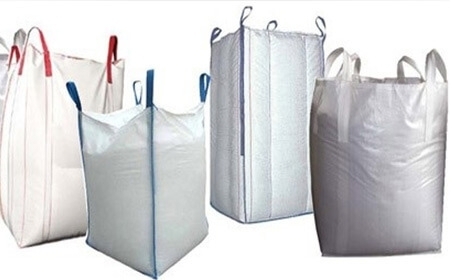 Our bags are widely used by various industries such as, Chemicals, Foods, Cement, Fertilizers, and Building Materials and so on. Our decade long experience as a reputed manufacturer in the polymer woven industry has established ourselves as one of the leading suppliers of FIBCs across the globe. Our complete range of machinery is from the world leader in the woven machinery industry. Our FIBCs are accredited with International certificates from reputed test laboratories. We are also equipped with in house test facilities like, UV testing machines, Tensile strength testing machines etc, cyclic test machines to name a few. Also attached above is our brochure for your ready reference.